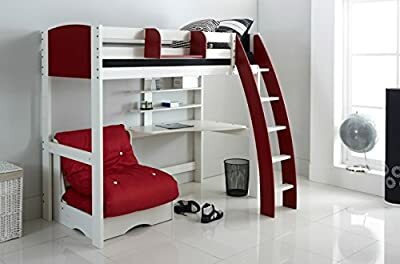 Scallywag Kids High Sleeper Bed - White/Red - Curved Ladder - Integral Desk & Shelves - Chair Bed - Hook on Shelf. Made In The UK. Product prices and availability are accurate as of 2019-04-24 20:38:49 UTC and are subject to change. Any price and availability information displayed on http://www.amazon.co.uk/ at the time of purchase will apply to the purchase of this product. We are a long established leading UK Children's Bed & Furniture Manufacturer. 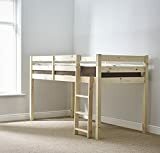 By producing this High Sleeper Bed complete with Desk, Shelves & Pull Out Chair Bed, solely for direct retail, we are able to offer outstanding value for money. Please note this is NOT a low quality imported product, but manufactured with care at our factory in Mirfield, West Yorkshire. Small Footprint. Matt White Sprayed Frame with Ladder, End Panels and Hook on Shelf in Red. Unique design including desk and two shelves which can be fitted to either the left or right hand side. Ladder can be fitted to either the left or right hand side. Wide ladder treads. Mattress not included, available to order separately. In line with BS & EC regulations, we recommend this bed not suitable for children under 6 years of age. Package includes Free Standing Chair Bed with Red Futon Mattress - Great For Those Sleepovers! Bed: 20H x 79W x 188L cm Chair: 75H x 79W x 85D cm. Designed & Manufactured in Yorkshire Ensuring The Highest Quality, Specification & Service. Extensive Range of Complimentary Furniture Available In 8 Colour Combinations (Delivery 4 Weeks). (Accessories not Included). We have been designing and producing exclusive furniture for over 60 years, from our factory in Yorkshire. 2 Year Guarantee. Free delivery to mainland UK destinations, please contact us for delivery costs to the following areas: Channel Islands, Isle of Wight, Isle of Man, Scilly Isles, Scottish Highlands, Scottish Islands, Northern Ireland & Republic of Ireland. Direct From Leading UK Children's Bed Manufacturer www.scallywagkids.co.uk 196cm (Length) x 98cm (Width) x 177cm (Height). Overall width (Inc. Curved Ladder): 143cm Mattress not included. Click the 'Scallywag Kids' Link (Above) For Our Range of Mattresses Flat Pack For Easy Home Assembly Ladder can be fitted to either the left or right hand side.